Power-dependent Overhauser dynamic nuclear polarization (DNP) enhancements and continuous-wave electron paramagnetic resonance (EPR) spectra of nitroxide radicals were measured in the magnetic field of a mobile Halbach-array permanent magnet and compared with results from a commercially available electromagnet. DNP saturation factors for varying microwave power were obtained from both measurement series and used to investigate how the increased magnetic field inhomogeneity present in the Halbach magnet affects the saturation efficiency. 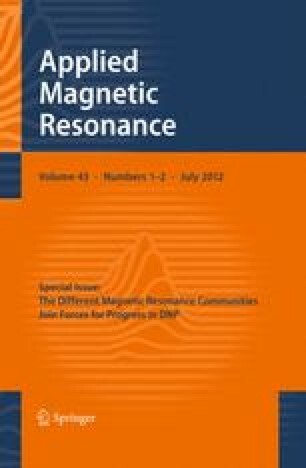 An EPR detection system was designed to allow continuous-wave EPR measurements at microwave power up to 20 W. Our results show that despite the lower magnetic field homogeneity, a Halbach-array magnet can be used for EPR and DNP-enhanced nuclear magnetic resonance of high quality providing almost the same performance as a more homogeneous electromagnet. The online version of this article (doi: 10.1007/s00723-012-0347-4) contains supplementary material, which is available to authorized users.